Aah, Another company added to the Windows based Devices List. ALCATEL, on October 9th revealed its One Touch View with Windows 7.8. The official Alcatel One Touch Russia Twitter account (via WMPU) posted two images of an Alcatel Windows Phone device branded under their One Touch family. The Alcatel One Touch View will sport a 4 inch IPS LCD Touchscreen and will pe powered by a 1 Ghz Qualcomm MSM7227А SoC processor bundled up with 512 MB of RAM. It will come with a 5 MP Camera on the back and also a VGA Front facing camera. Under the hood, there will be a 1500 mAh battery with 4 GB of internal storage. There aren't much specs the leaked sources revealed. But the phone should come in black and orange colours. The device is expected to hit the markets before the end of the year and yeah, cost around 7990 rubles (approximately USD256). It is said that the phone would be aimed at the budget phones market. Let us see how does it goes for the Alcatel Windows Phone with Samsung, HTC and Nokia also revealing their own Windows Phones. 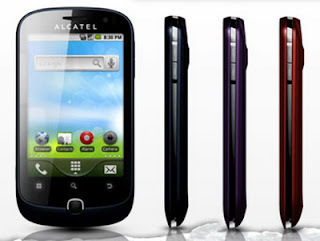 0 Respones to "Alcatel One Touch View with Windows Phone 7.8 revealed"